Yup, it’s in there – that characteristic fresh sage-loamy “garrigue” quality that shouts "Sangiacomo Vineyard". Mouth-watering aromas of cedar forest and black cherry. Kerith describes this wine as a pensive pinot, miraculously shape-shifting in the glass if you’re patient enough to savor the bottle over a few hedonistic hours - the problem being this wine is awfully easy to drink, and I doubt you'll find it lasts that long! Wine Enthusiast – 93 Points. From the husband-wife team of Brian and Kerith Overstreet, who’ve been quietly producing wine for ten years now, growing annual production from a single barrel (~25 cases) in 2008 to almost 1,500 cases today. Kerith decided her life's purpose was to be a winemaker after graduating from Cornell and starting her career as a surgeon. To say she's sharp is an understatement - I tried to calculate the IQ of someone who, after becoming a mom, taught herself to recite Goodnight Moon in 27 languages, but my abacus doesn’t go that high. 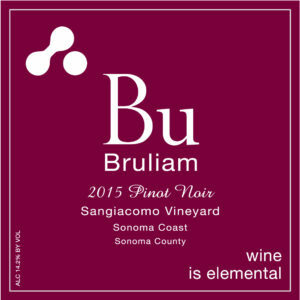 It's Kerith's science background that inspired the winery's slogan "wine is an elemental part of life", and the winery's name - “Bruliam” - which is suggestive of a new entry in the scientific chart of the elements. It's actually a portmanteau of their kid’s names – Bruno (short for Brunello), Lily and Amelia!